Happy Canada Day, O-sters! Big Daddy Donnie and your bro Dan-e-o are back to celebrate their nation's birthday along with everyone's favourite fatty, Frank Fronte! It's quite the celebration too, as Dan-e-o's brother, Brian "Bitchassmuh" Faraldo of The Score visits Tha O Zone Lair to rub salt in the wounds of Portugese soccer fans everywhere! This week, the 174th edition of tha show that makes you "O" introduces a new "anthem", while still bringing you the best in "Locker Room Radio". Check it out now by pressing play, launching in a new window or downloading the mp3 now! "Tha Pit Stop" with The Notorious T.I.D. 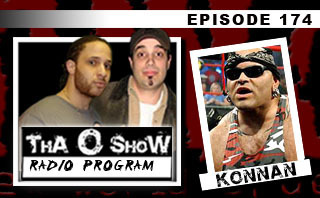 AND "Tha Round Table" featuring Cuban born wrestling superstar, and a huge player in this business... Konnan! 0 comments: on " "